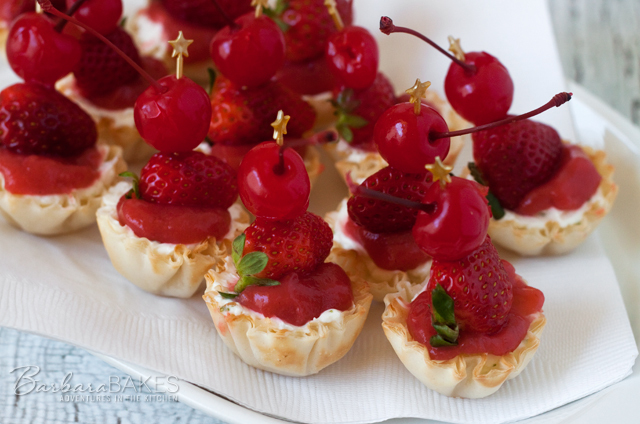 Crisp, flaky mini fillo shells filled with a creamy, tart lime no-bake cheesecake, topped with a sweet fresh strawberry topping and garnished with half a strawberry and a maraschino cherry. The flavors you love in a Strawberry Margarita in a fun to eat mini dessert. Today’s recipe for No-Bake Strawberry Margarita Cheesecake Bites is the second of three mini dessert recipes that I developed for Athens Foods. Monday I posted the Pina Colada Cheesecake Bites recipe, and next Monday I’ll post the third mini dessert recipe, Orange Sunrise Cheesecake Bites. These No-Bake Strawberry Margarita Cheesecake Bites are super easy-to-make and inspired by one of my favorite drinks, a strawberry margarita. 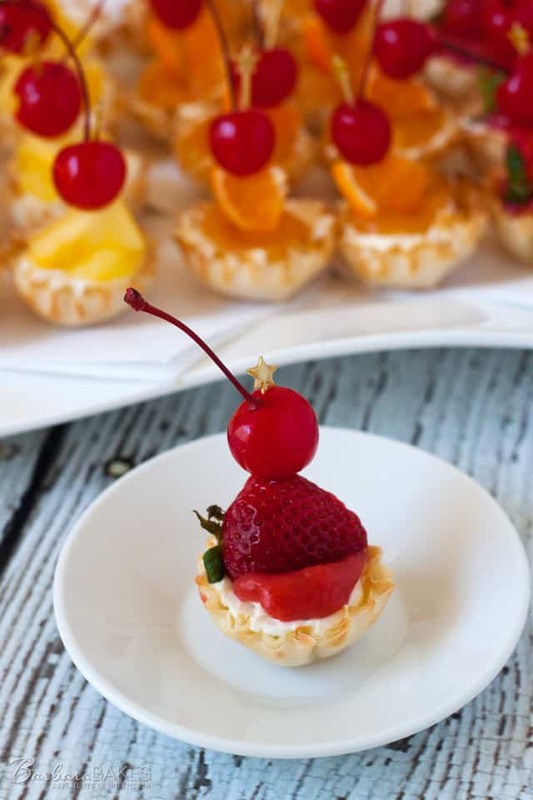 The sweet strawberry topping is paired with a luscious, tart lime cheesecake served in crispy mini fillo shells, then dressed up with half of a strawberry and a maraschino cherry on a festive golden star toothpick. The strawberries need to be blended and strained so that you remove most of the seeds. You’re topping will still have a lot of the strawberry pulp, but the pulps adds a fun, more strawberry margarita like taste to the dessert. I used frozen sliced strawberries in the strawberry topping because they’re softer and blend much easier. You could substitute fresh strawberries, but you may have to add the lime juice to the blender to get the strawberries to start breaking down. It worked best if I pushed the toothpick straight into the center of the cheesecake bite and into the fillo shell. However, you don’t need to skewer the fruit. 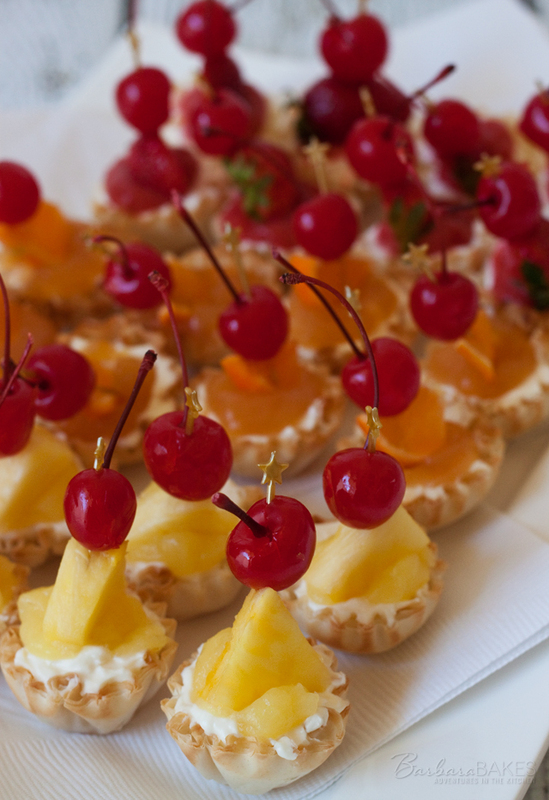 If you wanted a simpler garnish, these cheesecake bites would be pretty with just a cherry on top. My son-in-law said he loved all three, and his favorite was which ever one he was eating at the moment. I know your family/guests will love them too! 8 fresh strawberries, for garnish. Prepare Strawberry topping: Puree strawberries in a blender or food processor to create mostly strawberry juice. Press pureed strawberries through a fine mesh strainer in to a small saucepan. In a small bowl, mix together 3 tablespoons sugar and cornstarch. Stir into the strawberry juice in the saucepan. Bring to a boil over medium heat, stirring constantly, until sauce thickens and is clear. Cool to room temperature, then refrigerate until chilled, at least 1 hour. In a small mixing bowl, beat together cream cheese, sour cream, 2 tablespoons sugar, lime juice, and 1 teaspoon lime zest until smooth. Fill each shell with the cream cheese mixture. Top each with one to two teaspoons of strawberry topping. Garnish with a strawberry on a skewer. 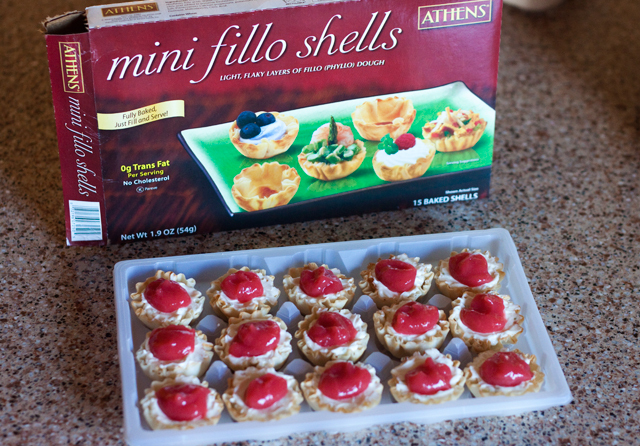 Those little mini phyllo shells are my favorite holiday shortcut. They make amazing little dessert cups. I love that strawberry margarita combo…yum! These are adorable! I could eat at least 6 in one sitting! Theses are adorable, I love how easy this is! I LOVE those shells. I also love appetizers that are one bite and you can get it all in your mouth without leaving crumbs on your ‘shelf’, if you know what I mean. Delightful cheesecake bites! This is SUCH a cute treat, Barbara! I love that you’ve been filling up all these adorable shells with wonderful flavors. I’d really love to grab my own box of shells so I can make equally cute dessert trays this holiday! These are so cute! And they sound and look delicious! These bites are just the right way to bring in the new year without too much of the sugar,butter,eggnog,booze,duck pate,fritos,peppermint,dips,fudge,toffee,cakes and pies that we have indulged in for the past month. Thanks and Happy New Year! These little bites look so adorable and festive. I love fuss free and easy recipes like this. Thanks for sharing, Barbara and Happy Holidays to you! Those are so darned cute. I love the way your son-in-law thinks…I think I’d be inclined to agree with him. It would be hard to choose a favorite flavor-you can’t go wrong with any of them.